Accompanied on harpsichord by Alexandra Nepomnyashchaya, Lucie Horsch (b. 1999) performs Recorder sonata in D minor (HWV 367a) by George Frideric Handel and Concerto for 2 Violins in A minor, RV 522 by Antonio Vivaldi. Recorded during the Buma Classical Convention in 2014 in Tivoli/Vredenburg in Utrecht, when she was only 15-year-old. An amazing baroque music performance published by 24classics. 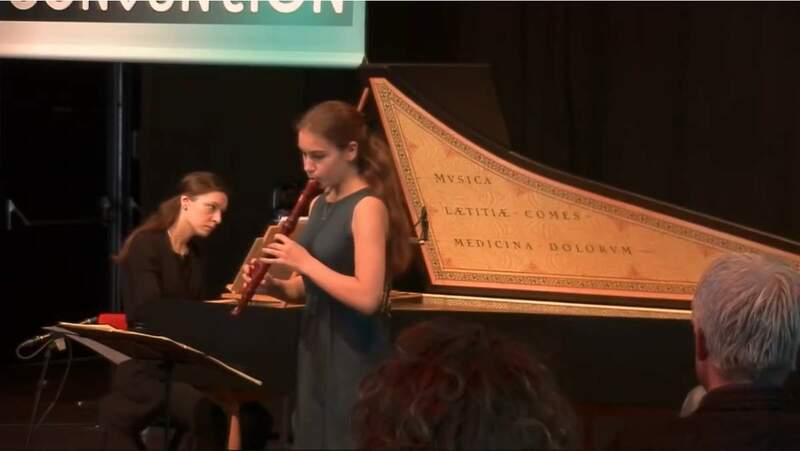 Lucie Horsch performs Recorder sonata in D minor (HWV 367a) by George Frideric Handel and Concerto for 2 Violins in A minor, RV 522 by Antonio Vivaldi. Lucie Horsch is one of the most remarkable musical talents of her generation, and already in great demand as a solo recorder player both in her native Netherlands and internationally. She is performing with baroque ensembles as well as with modern orchestras. At the age of nine, her televised performance of Brahms’ Hungarian Dance No 5 at a popular concert on the Prinsengracht canal caused a national sensation. In 2014, she was chosen to represent The Netherlands in the Eurovision Young Musician contest. In 2016 she was awarded the prestigious Concertgebouw Young Talent Award, in the presence of Sir John Eliot Gardiner. Lucie also performed in the televised farewell concert for the former Queen Beatrix. Her career takes her across the continents. After Lucie’s successful debut with the Los Angeles Chamber Orchestra and Stephen Stubbs in March, Lucie returns to Canada to work with the Manitoba Chamber Orchestra. She goes to Brazil for the first time to perform at the Festival Internacional de Música Clássica de João Pessoa and performs in Asia with the Macao Orchestra. In recital Lucie returns to Amsterdam’s Concertgebouw in the “Jonge Nederlanders” series. She also appears regularly with harpsichordist Alexandra Nepomnyashchaya throughout the Netherlands. Festival appearances include the Weingartner Musiktage, Festspiele Mecklenburg Vorpommern and MDR Musiksommer Leipzig. Lucie embarks on a new duo with French lute player Thomas Dunford, their debut recital takes place in Hannover in January 2018. Born into a family of professional musicians Lucie began to study the recorder with Rob Beek at the Muziekschool van Amsterdam at the age of 5. In 2011, after winning many competitions, she moved to the prestigious Sweelinck Academie at the Amsterdam Conservatorium, where she is now a student with Walter van Hauwe. Also a talented pianist, she first studied with Marjés Benoist and is now in Jan Wijn’s class at the Amsterdam Conservatorium. She was a member of the National Children’s Choir for seven years, performing with conductors such as Sir Simon Rattle, Mariss Jansons, Jaap van Zweden. Lucie plays on recorders by Morgan, Kulossa, Blezinger, and Hirao with the generous support of the Prins Bernhard Foundation.